Seeing as I'm from Ireland I might as well stoplight the latest Drexciya/Dopplereffekt related goings on there in July. 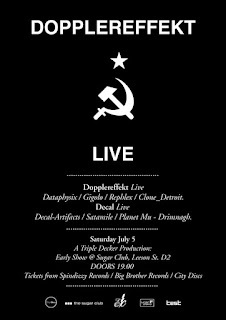 First off there is a Dopplereffekt live show taking place in the Sugar Club in Dublin on 5th July. Support is from Dublin electronic legend and long time friend of mine, Decal. It is a seated early gig which is said to be starting promptly, doors at 7pm. More details from link below. By the way, video’s from Dopplereffekt in Glasgow here. Also check out this great video for Japanese Telecom’s ‘The Making of Ultraman’. I'm not sure how many of you would be aware of it but I am also a conceptual artist, now you can see why I think and write the way I do! Well, a few months back, partly because of his knowledge of DRL, Dennis McNulty, an artist and one of the curators of an upcoming art exhibition asked me to get involved with an exhibition he was putting together. “'Underground' is an exhibition and publication looking at the changes in independent music culture over the last 15 years, tracking the relationship between the local and the global, society and technology and charting the erasure of the boundary between the public and the private.” There are many artists featured so my piece will of course be only a small part of the whole. One of my contributions is a 6 minute video called 'Find Your Own Story' which takes Drexciya as subject and context as theme. To a soundtrack of Drexciya's 'Birth of New Life' from 'Harnessed The Storm', I run a sequence of roughly 40 or so James Stinson quotes and titles of tracks and albums etc. The texts are all black on a white background and I hope on the surface level I have managed to design it to intrigue people not familiar with Drexciya and their world. Going deeper, whether people know them or not I am interested if people will try to find a meaning in the sequence of texts, the order is one quote followed by 4 titles. I have certainly worked in a meaning as well! Going beyond that I have an ongoing fascination with context and by picking certain quotes and titles and ignoring others I inevitably lead you in a certain direction. Not that I am consciously doing that with DRL, here I try to give you all the information I have for you to make up your own mind, but I do, wrongly or rightly, choose to give you my own interpretation as well. Using simply text and music in the film of course mirrors what I work with when doing DRL. Hopefully at the very least it will, as I said, intrigue a few more souls into their world. The coincidence of both events over lapping is purely luck, the last day of the exhibition is on the 6th July, which is the day after the Dopplereffekt gig. Maybe they will be tempted to visit? If so, they and anyone else will be very welcome.The exhibition takes place in the basement of Road Records on Fade Street in Dublin city. There will be an opening held at 6pm on 27th June and it will run to 6th July. More information can be found here. An 80 minute film I made in 1998 to document the final night of a Dublin club called Phunk City will also be screened as part of the same exhibition in conjunction with Dublin’s Darklight Film festival. Does this have anything to do with Drexciya? No, but it makes me happy! If you feel like reading further I was asked to write an essay for the publication which will be released to coincide with the exhibition. I guess the essay belongs here, if it was another artist I certainly would have included it. They had all the essay’s professionally edited by the way in case you wonder why it doesn’t sound like me at times! The stuff about me at end is also in publication so I have included it as well. I believe we are truly poised to take a step forwards in the evolution of music. On a basic level I see current changes offering a chance to free a new generation of artists from excessive ego satisfaction and from commercial pressures. However, far more interestingly, I see the potential arising for the return of mystery - giving us a chance to be curious about music and its artists again. Making us go to the music, seeking it out, rather than it coming to us and having to fend it off. This will not happen overnight. Commercial pressures persist while some artists only use MySpace as another way to publicise more minutiae about themselves. But perhaps a new movement of happy-to-remain-anonymous artists who pursue music more as a hobby may emerge, or professional artists may use the ease of digital distribution as a chance for the proliferation of side projects and collaborations to stimulate their creativity. This is already happening but it could become the driving force of new music. If so, the medium will certainly have formed the message and in this case, I believe we will be onto a good thing. Some time at the latter end of the 20th Century, one of the pioneers of electronic music, Alexander Robotnick remarked on the evolution of how we consumed music thus: "In the ‘60s and ‘70s there were no music genres but the fundamental ones such as jazz, rock, classical and easy listening. Each band or artist was a different thing. Then there were those who imitated them. Today if you imitate an artist you're not considered an imitator but someone who belongs to that music genre. This 'collectivisation' of artistic expressions kills individual ingeniousness and depresses the quality level. Now there are thousands of artists who all sound alike and can only be distinguished by the music genre they make. The audience is confused and no longer interested in artists and ends up relying on DJs who therefore become the real bosses of the music system." This doesn't sound particularly positive... more like another step on the path towards the death of originality in music. And since that time, the sheer volume of music and artists now on offer ensures that we continue to rely on DJ’s and tastemakers to pinpoint and publicise the best for us. A lot has been written in the last 10 years about how the art world itself has come to mirror the music business in just this regard. Certainly we are currently living in the age of the curator. Obviously, discrimination in music has been important for a long time but with a return of mystery we will have to do more of the discriminating for ourselves, becoming far more discerning in the process and thus ultimately becoming our own DJ's/curators. Once this happens we will begin to programme ourselves - rather than being programmed by others. On initially discovering them, I found that the genres of electro/techno/house offered an appealing anonymity. I would only listen to these sounds in a club context, and a good DJ could blend it all into one piece, thus making it a truly ‘collective’ effort. Up to that point I had been more of a guitar music fan – I had liked some of the more maverick electronic artists but they weren’t the kind of artists I was generally hearing in clubs. So, one of the reasons I stopped buying the weekly UK music press - another thing of the past - was that they did not write very much about this new music that I was discovering. It was in independent record shops, or in a relatively quiet corner of the club itself that I finally started to get names to go with these amazing and mysterious tunes. It was truly a word of mouth thing for me then and all the stronger for it when a DJ himself would tell you to check out so-and-so, or when a friend passed you a freshly burned CD. During this period of discovery, I learned again the old adage that when we are left to our own devices and cease to be spoon-fed, what we uncover for ourselves we take deep within us. The less exposed it is the more we feel it that it belongs to us. This equation works in all circumstances and cultures. We all know that all you have to do is ban something or artificially limit its availability in order to see its popularity increase. Sure, it’s not the same as the old days; I loved hanging out in record shops as it was never just about buying the music. Chat rooms and online forums aren’t the same, but this is also evolution and once you stop changing you die. Reaction follows action and right now this is where we find ourselves. And that, in my opinion, is deep in the most retrospective of ages. We live in a time when every artist and scene gets its own documentary, its own retrospective and reunion tour. And this in turn goes on to influence another generation of ‘new’ artists. Pop has always been on the verge of eating itself but never so close as today; witness the 'behind the scenes' information and 'access all areas'-type insights that we now expect from contemporary artists in every genre. The nature of this expectation is, I believe, engendering the certain death of mystery in the arts in general. This revealing of 'the truth' has only lead to cynicism - which is now rife, and infecting every aspect of our lives... we know all of the ‘how’ but very little of the ‘why’. The time seems ripe for something new to come along - a radical change is overdue. Context, as ever, is everything. So in this transitional period we must keep in mind that we are not always getting the work as the artist intended. Of course this loss of context could have positive aspects also, insofar as we will ultimately have to create our own context. And the artist will have to adapt to this new paradigm along with the listener. Since 2005 I have been championing just this type of group, Drexciya and all of their related and ongoing projects. My website ‘Drexciya Research Lab’ reviews and archives their work and also explores the meanings which I personally take from their intriguing music. The artist Ellen Gallagher has also used Drexciya as subject matter for a series of paintings entitled ‘Watery Ecstatic’ (2002-04), while the noted artist and filmmaker Kapwani Kiwanga has used them as subject matter in her 'Atlantide' (2008) film. Although this Detroit-based duo did leave artefacts of records and CDs behind them during the course of their operations between 1992 and 2002, they rarely did interviews, and never played live, nor did they even reveal their identities during the group’s lifetime. One of the duo was only identified in death. James Stinson died tragically in 2002 of heart complications and brought the group to an untimely end. In my opinion Drexciya have been proven to have been well ahead of their time in their truly underground attitude. Stinson’s musical partner - Gerald Donald aka Heinrich Mueller - has in recent years taken advantage of internet technology to more fully embrace the virtualisation of music and its inherent mystery, and he is now involved with at least three solely MySpace-based projects at time of writing. Still rarely interviewed, he has begun to play live, although he insists on wearing a mask when doing so. My ‘Drexciya Research Lab’ site communicates my instinctive reactions to how I feel about this group. It gives no clear answers and only makes me question further. This is nothing new - think only of the puzzles set by the lyrics of Bob Dylan to his fans in the 1960‘s - but it’s where I and others now find ourselves, and we are all looking for our own subjective answers. Drexciya’s conceptual approach employed the metaphor of a storm to describe a life-transforming process when (in 2000) they unleashed sevens albums on seven different labels around the world in one year. James Stinson said of his catalogue that "all the records we’ve made give you clues, how to tap into your inner selves. We bring you right to that door and give you the key. We’re doing what we’re able to, dropping messages from day one without getting too deep and scaring people off. We can only hope that people will pick up on what we’re doing.” Fittingly their storm maxim was ‘Don’t Be Afraid of Evolution’ - as to overcome fear is always the key to evolution. I can’t think of a more fitting message to leave you with concerning this subject. Don’t be Afraid of Evolution. Stephen Rennicks was conceived in 1972. He currently lives on a small holding in rural Leitrim where he practices as a conceptual artist. Notable works to date include the year long 'Junk out of Context'(2004) which explored the audio and video stock of Dublin charity shops; 'Trains for the Blind'(2004), a sound piece released in conjunction with the ESB Dublin Fringe festival; a six month 'secret residency' at Dublin Airport during 2005; 'Imagine Black Lough' installation at The Dock, Carrick-on-Shannon, Co. Leitrim and his debut solo show 'With & Without Context' at Mantua in 2007. He uses everyday materials not normally associated with art practice in his work; using things like free template websites, one-take films and standard photo lab processed prints, as part of an aesthetic that aims to demystify the medium for the viewer. However, the message in the work itself is always paradoxically designed to be multi layered and open to personal interpretation beyond its surface meaning. Since 2005 he has also been writing about Drexciya and their related projects. Nice to read something about yourself this time. i enjoy reading the blog while i call myself a fan. The nice thing is that the more information we get the bigger the mystery becomes. Dopplereffekt tomorrow night, woo woo, can't wait! Just arrived in Dublin on Wednesday! I visit this blog so many time,because every time something new,and I read all articale your blog, very interesting.